This week’s post is written by guest blogger and buddy Alison Taylor, fisherwoman extraordinaire. I spent a number of years working in a big city, where I did the mad dash from the commuting train to the office. Rushing past the office towers, surrounded by concrete and glass and then jumping in the elevator and getting to my desk and logging into my computer to start my day. Then at the end of the day, I would do it all over again heading back to the train station and hope I made it in time to pack in with my fellow commuters for the ride home on the train. Then I would get home, park in my driveway of my high density subdivision and walk into my house shut the door behind me and then do it all over again the next day. How times have changed. A number of years ago I made a decision that it was time to take note of my surroundings and be in an environment that would feed my soul, make me smile, give me a chance to take a deep breaths and enjoy the smells and beauty around me. I found a place that “feeds” me in this way and I found a “happy act” that I participate in every summer that brings me joy. I left the big city and settled down in a small community just west of Kingston. No more mad dashes, no more concrete, glass office towers. Now I drive to Kingston on country roads, walk to the office admiring the limestone buildings and the view of Lake Ontario. At the end of the working the day I drive along the country road that I live on which has ditches full of wild flowers and behind our house are paths through the forest that invite you to explore. The air is full of such freshness and the sweetness of blossoming flowers. Lilac bushes are bursting, buttercups and daisies are bending out towards you, the purple vetch plant has welcoming purple flowers and wild asters beckon you to come closer. I take long walks and pick a variety of wild flowers along my way. By the time I complete my walk I have gathered a lovely bouquet. I take my collection of flowers and put them in vases in my house, on my deck and even take them to work and place them on my desk. They remind me that it is important to take a moment and enjoy the beauty around me. For some, beauty is in the glass and concrete of the big city, but for me, beauty is in the growth and development of the summer wild flowers that grow along the wayside, waiting for someone like me to pick just a few and enjoy their simple beauty. My Happy Act is “Picking Wild Flowers”. I invite you to try it…there are plenty of flowers for everyone and you might just find it will bring a little more happiness to your day. Jeez, I can’t remember the last time I picked wild flowers, let alone took the time to smell the roses. I’m lucky if I get a chance to stick my nose in the flower fridge at Loblaws! Next time I see some flowers, I’ll pull over and pick a few…after researching what poison ivy looks like, of course. 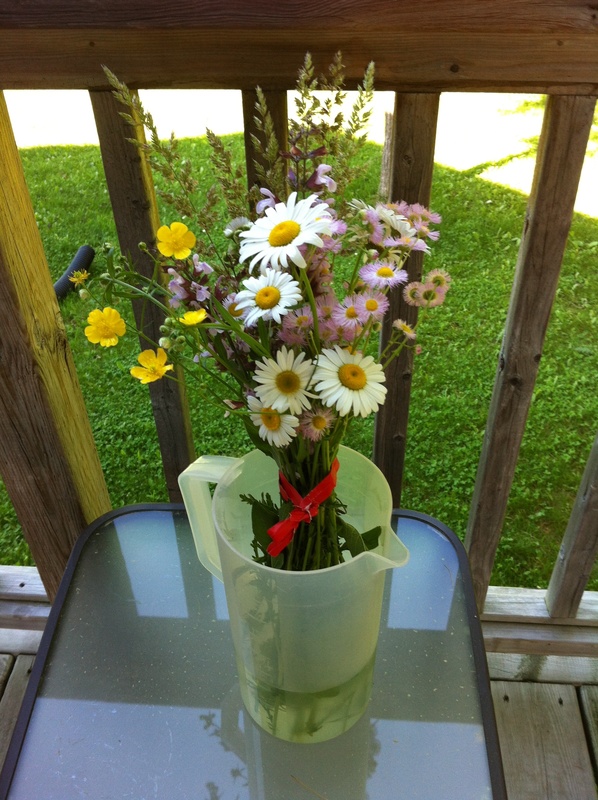 It’s nice when your kids bring in a mason jar full of wildflowers. I give them a jar and send them into the backyard to find beautiful flowers (aka dandelions). I remember picking dandelions for my mother when I was a child. And definitely watch out for poison ivy! My sister-in-law recently went to transplant some trilliums and was exposed to poison ivy–it took two rounds of steroids to knock the poison ivy out of her system. Thanks for a wonderful blog post, Alison!